When you meet someone new, you should look that person in the eye, offer a firm handshake, and smile. Greeting someone new (and making a good first impression!) is an important skill — one that falls within the complex and multifaceted umbrella of social and emotional learning (SEL). 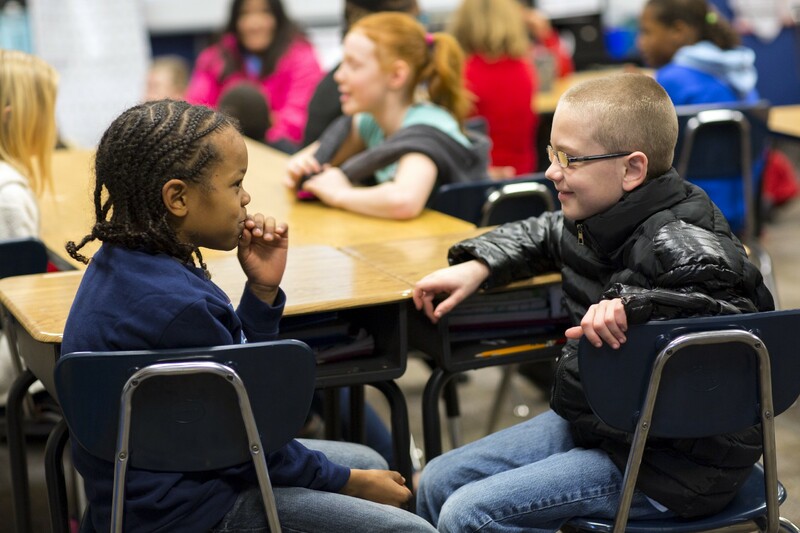 Students are often taught specific strategies, such as making eye contact and shaking hands, to support the development of SEL. In fact, research has demonstrated that integrating SEL instruction into the academic day is critical for positive and continuous growth in both academic learning and in SEL, the set of skills typically framed in terms of broader core competencies, including building relationships, setting goals, developing self-awareness, and making responsible decisions (Durlak, Weissberg, Dymnicki, Taylor, & Schellinger, 2011). Experts caution, however, that a one-size-fits-all approach to SEL instruction may not be the best fit for many learners. The reason for this lies within human nature itself: our social interactions, behaviors, and emotions are intricate and fluid; moreover, they are heavily influenced by other factors, such as our cultures. For example, consider again: how should we greet a new person? In many cultures around the world, the strategy of making eye contact would be considered disrespectful rather than friendly or polite. Other cultures employ different strategies entirely. In Tibet, it is often considered more appropriate to extend one’s tongue to say hello. In Zambia, a greeting might instead begin with clapping. In still other cultures, an initial greeting should always begin with a bow. With so many different types of greetings, how do we decide which to teach? Now take this a step further: if we teach students one set of social practices, how might such teaching impact a student whose native culture may recommend something else entirely? The intersection of culture and SEL is an important one, since school settings are often meeting grounds for learners and educators from a rich and diverse range of cultures, languages, and behavioral norms. Given this, scholars across several disciplines are exploring how cultural responsiveness, or the practice of respecting and learning from a multitude of cultures, can influence how students develop SEL competencies. Researchers in California and Texas, for instance, have examined how a culturally adapted SEL program can support adolescent Latino students (Castro-Olivo, 2014; Cramer & Castro-Olivo, 2016). To adapt the program, the researchers not only translated materials into Spanish from an existing English-only program, but also found that they needed to incorporate new and culturally relevant content that had been tested with focus groups and experts to ensure that it was aligned with cultural norms, goals, and values of the participants and their families and communities. In addition, teachers were provided with specialized training in the social and emotional needs of students prior to delivering the program. Initial results of this work were promising: in studies of the program, students demonstrated significant growth in SEL knowledge and emotional resiliency through the adapted program. In discussing SEL initiatives, Dr. Dena Williams notes the need for more work in this area, stating that “school-based social-emotional learning programs have the potential to shift the climate and culture of our schools, but they do not always guarantee that students will apply the skills they learn at school to their lives outside the classroom, especially if those skills seem irrelevant to their realities” (2017, n.p.). A culturally responsive approach, one that situates and celebrates learning within the rich cultural contexts of students, may be the key to bridging this gap and ensuring that all students can reap the full benefits of SEL instruction (Irvine & Hawley, 2011; Ladson-Billings, 1994). Currently, there are few established best practices to guide the design and implementation culturally responsive SEL, but stakeholders across the education ecosystem are already working together to explore new possibilities. In Alaska, for example, the Association of Alaska School Boards is working on a four-year grant to improve school climate through school-wide commitments to teacher and student SEL programming. Within the Culturally Responsive and Embedded Social and Emotional Learning (CRESEL) program, students and teachers work together address surface strategies (“how should we greet a new person?”) and move into deeper territory, such as how to co-create a culturally relevant school climate and how to help teachers examine any implicit bias they may bring to the classroom. Importantly, this model also takes into account regional topics and practices, such as how to incorporate seasonal subsistence into skill-building in the classroom, and how to acknowledge the nuances of different Native Alaskan tribal values when teaching students about behavioral practices. For many, though, the concept of culturally responsive SEL is still quite new and may seem rather challenging. This is understandable; if something as straightforward as a greeting is actually not very straightforward at all, then tackling the entire spectrum of social and emotional learning from a cultural lens can seem even more daunting. On this, however, experts already agree: just as when we greet new people, a good first step is to open our minds, open our hearts, and simply decide to begin. Castro-Olivo, S. M. (2014). Promoting social-emotional learning in adolescent Latino ELLs: A study of the culturally adapted Strong Teens program. School Psychology Quarterly, 29(4), 567. Cramer, K. M., & Castro-Olivo, S. (2016). Effects of a culturally adapted social-emotional learning intervention program on students’ mental health. Contemporary School Psychology, 20(2), 118–129. Durlak, J. A., Weissberg, R. P., Dymnicki, A. B., Taylor, R. D., & Schellinger, K. B. (2011). The impact of enhancing students’ social and emotional learning: A meta‐analysis of school‐based universal interventions. Child development, 82(1), 405–432. Irvine, J. J., & Hawley, W. (2011). Culturally responsive pedagogy: An overview of research on student outcomes. In A paper prepared for Teaching Tolerance: A Project of the Southern Poverty Law Center: Culturally responsive teaching awards celebration: Pew Conference Center, Washington, DC: December (Vol. 9, p. 2011).